I vacationed in Orlando last week. 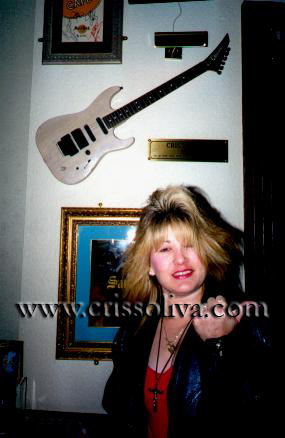 I remember reading somewhere that Criss Oliva had a guitar in the Hard Rock Universal so I tried to scope it out. I went there for dinner one night and asked the waiter if he had any idea where it was. Of course he did not but he called someone else over and she looked it up. She said it was in the "Florida Room" but that room was rented out for a private event. I returned later in the week when they first opened so I could find the guitar and check out some of the other stuff they had. I have only been able to find one other picture online from https://marlastone.wordpress.com/2015/03...t-in-1993/. I am not sure what year the picture is from but it looks like, at some point, they also had a framed Sirens cover and a different plaque. The current plaque inscription reads, "Savatage formed in Tarpon Spring, Florida in 1978 as Avatar, led by brothers Jon (Vocals) and Criss (Guitar) Oliva. They changed their name to Savatage in 1983, pursuing a strongly Judas Priest - and Iron Maiden - influenced style of metal. This Charvel 6 string electric guitar with an off-white stained body finish was owned and played by Criss Oliva." Here are a few pictures. No idea why they are so small but click them to enlarge.